Like millions of other immigrants who have come to America seeking a new life, you have dreams of being an entrepreneur and owning your own business. As a hardworking business owner, you’ll face many challenges. This book can help you overcome those challenges and put you on the road to success. 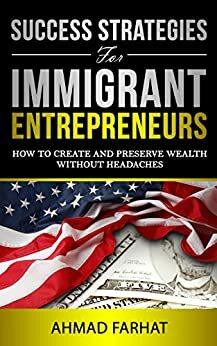 Written by an immigrant who arrived on these shores with no money and big dreams, Success Strategies for Immigrant Entrepreneurs reveals what it takes to make it in America. Writing from personal experience, Ahmad Farhat gives you insights into the challenges you’ll face—creating your business plan, hiring employees, meeting regulations, paying taxes, leading your company, incorporating your business, and much more. His advice, which is based on his journey from the streets of New York to owning several successful businesses, will help you anticipate problems and avoid headaches. If you or someone you know is an immigrant who dreams of being an American entrepreneur, this book is for you! Ahmad Farhat is an entrepreneur who immigrated to the United States in 1988. In 1996 He received a bachelor of science degree in electrical, biomedical and clinical engineering from California State University, LB. Even though Farhat has an engineering background he spent many years working in sales. In this role, he used his scientific mindset and reasoning skills to adapt a new strategy to solve problems and fulfill the needs of others. A successful businessman with a variety of interests, Farhat is proud owner of a profitable automotive dealership, is a real estate investor, and operates several online companies. A man of faith, Farhat is blessed with a wonderful, supportive wife and four beautiful children.